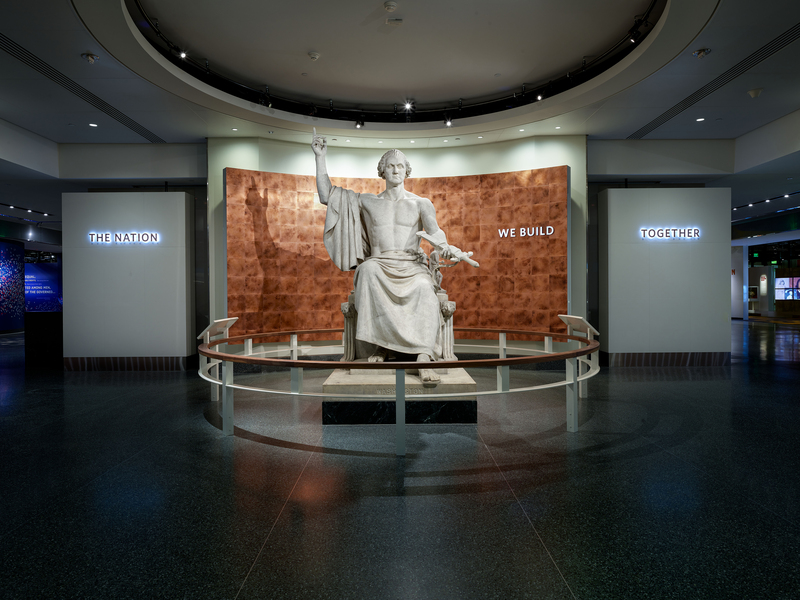 Horatio Greenough’s 12-ton marble statue of President George Washington serves as the Landmark Object to the newly renovated second floor of the Smithsonian’s National Museum of American History. Under the theme, The Nation We Build Together, the exhibitions on this floor tell the story of America’s founding and future as a country to fulfil the principles and ideals of freedom and opportunity. The origins of the statue date back to 1832, when the U.S. Congress authorized Greenough (1805–1852), the first professionally trained American sculptor to be awarded a federal commission, to create a monument to Washington for the centennial of the first president’s birthday in the rotunda of the United States Capitol. The result of the eight-year project was a grand statue of Washington honoring America’s great example of liberty. Greenough’s robed statue of Washington was executed in the neo-classical style, inspired by the classic statuary of ancient Greece, the home of the world’s first democracy. The conception of the seated figure derives from a famous lost statue, the “Olympian Zeus” by the ancient Greek sculptor Phidias. Additional carvings on the sides of Greenough’s work depict the Greek god Apollo and an infant Hercules. Further designs feature small flanking figures of an American Indian and Christopher Columbus, representing the New and Old Worlds. The most important symbol is the sword in Washington’s outstretched hand, which represents how he relinquished his military power to the people. Washington’s features copy the life-portrait bust by the French sculptor Jean Antoine Houdon. Despite this accuracy, Greenough understood that his sculpture did not fit the impression most Americans had of Washington. Upon completion in 1841, the statue stood in the center of the Capitol rotunda. While many viewers appreciated Greenough’s attempt to create a timeless masterpiece, others rejected an inappropriately dressed Washington. At Greenough’s suggestion, the monument was moved to the Capitol grounds in 1843. For the next 60 years, the statue was exposed to the elements until it was transferred to the Smithsonian in 1908. The sculpture is part of the Smithsonian American Art Museum’s collection. It has been on view at the National Museum of American History since 1964 when the museum opened to the public. The Nation We Build Together, the exhibitions on this floor tell the story of America’s founding and future as a country to fulfil the principles and ideals of freedom and opportunity.